Lesson 11!! Can you believe it? We are moving right along. Today we are talking about using the Scale and Shear features. Last week we talked reviewed all the features in the Modify Panel check out the post here. 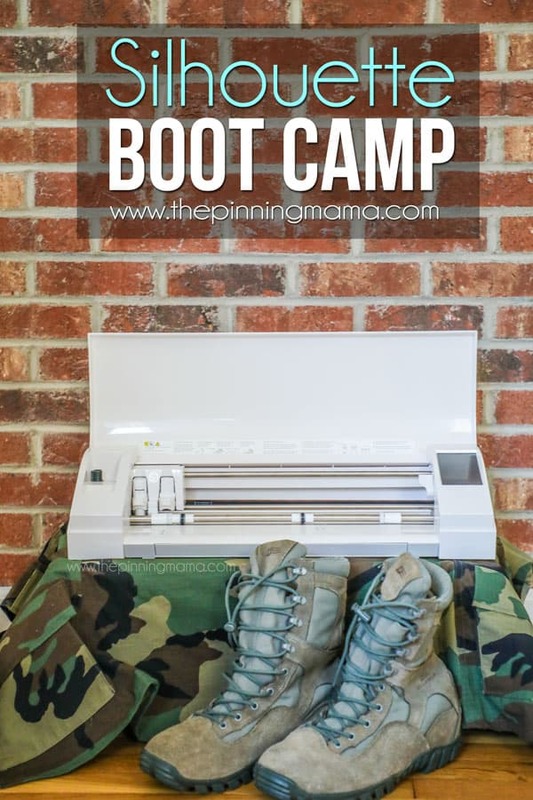 Silhouette Boot Camp is filled with mini lessons that help us learn the terminology used in the Silhouette Studio software so that we can cut any design we can dream up with ease! If you are new here, take a look the Silhouette Boot Camp Welcome with all courses listed and catch up on any you missed. Pin this post! Each of these lessons takes me on average, 8-12 hours to create for you. I can do these lessons for FREE thanks to your support in coming to my site, reading the tutorials and sharing it with your friends. By pinning this post or sharing it on Facebook with your Silhouette friends, it helps you know where to find it if you need to reference it again, and it helps me spread the word so that I can keep the resources and freebies FREE to you! What does Scale mean in Silhouette Studio? Scale in Silhouette Studio means to adjust to the correct size and shape of your desire. This is a great feature to use when you need to adjust your object to an exact shape. How do I use Scale? To scale an object, select the object or every single piece, by either using Select (the arrow icon in the top left bar) to drag a box around the objects or click on each object while holding down Shift, group them together. Then on the Right hand column select Transform, click the second picture that looks like an arrow pointing to the side, go to Specify Dimensions in that window, change your dimensions to the size you are desiring and click apply. You can also change the scale of the object by dragging the box when the object is highlighted. 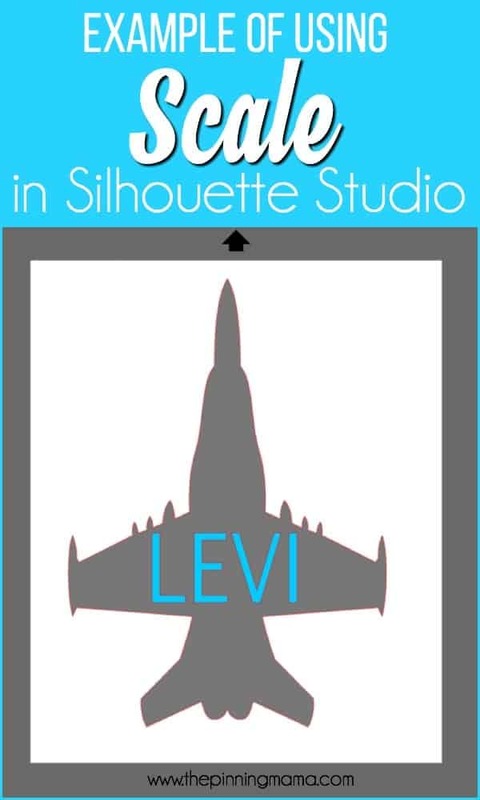 Where do I find Scale in Silhouette Studio? You can find how to change the scale of an object in a few different places, but both places take you to the same screen where you change them. I have this picture of a jet and I wanted my sons name to be the exact dimension of 2.5 x 3.5… I will show you what I’ve done in this picture. I am going to make some wall art for a frame in his bedroom. This is useful when you want to make your object or picture an EXACT size. Sometimes it’s hard when you are dragging the object by using the boxes when it is highlighted to get the EXACT size. So by using the transform/Special dimensions box you can type in your exact size needed. 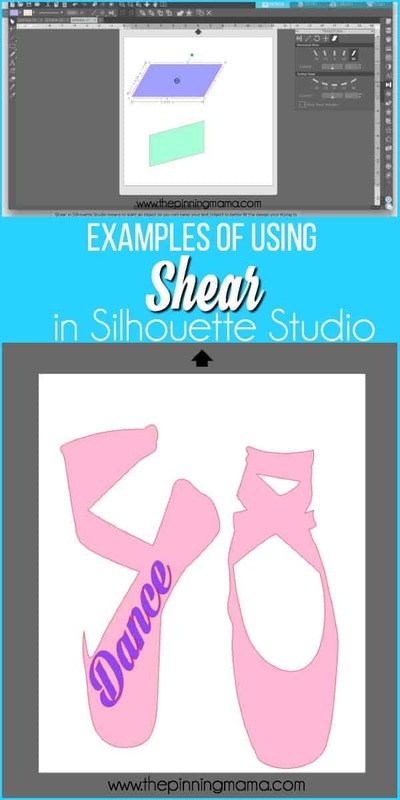 What does Shear mean in Silhouette Studio? 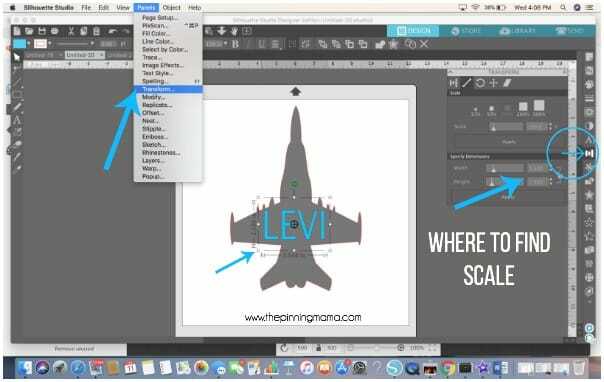 Shear in Silhouette Studio means to slant an object so you can bend your text /object to better fit the design your trying to achieve. How do I use Shear? To shear an object or text, select the object, making sure all objects you want to shear are highlighted with a gray box, go to right side of your screen and find the transform icon. 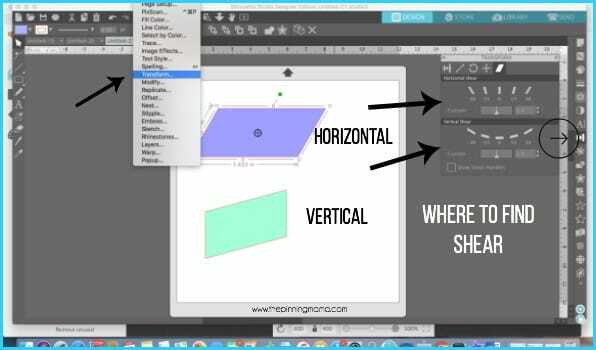 (3 rectangles with a line) Once you have selected the transform feature find the angled rectangle in the top of the box, click on it. Now you can add a horizontal shear or a vertical shear. Where do I find Shear in Silhouette Studio? You can get to shear by clicking in two places, but both places takes you to the same screen. Right hand side of the screen, select the transform icon and then select the slanted rectangle inside the transform icon. In the top menu, click Panels, then select Transform. This will take you to the triform box where you can shear your object or words. This is a very simple example but it shows you how fun it is to use shear. I drew two rectangles, I then used horizontal shear on the top one and vertical shear on the bottom one. I also wrote the words dance using the font Dark Larch, then selected horizontal shear at 30 to make the words fit perfectly on the ballet shoes. This is a great design I’m going to use in a frame for my little girl’s room. The Shear feature is useful when you want to make a text look italicized, or fit in a certain slanted space. You can also create custom designs like a chevron pattern. You could make one chevron then duplicate it down the page. You could do a zigzag pattern across the top or bottom of your paper for a border. Making your own designs by using the different features in Silhouette is very rewarding and fun. You can also select Show Shear Handles and you can move the shape in any direction to customize a shape or text to your desire. The shear feature is great in customizing anything to fit inside the space you would like it. You can change the look of words in so many different ways. Well that wraps up Lesson 11. 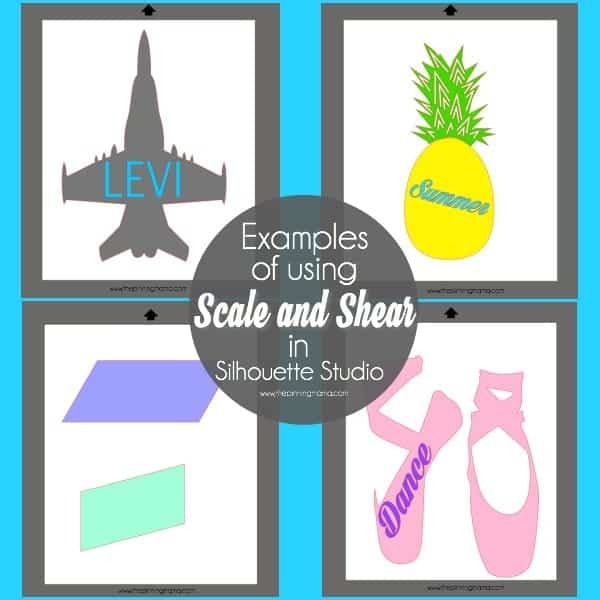 I hope you have some fun ideas of what you are going to create using the Scale and Shear features in Silhouette Studio. Join us next week to learn about Kerning and how to use it. Thank you! I was working on something yesterday trying to get a font to fit inside of a design and convert to path was not quite working the way I needed it to. Today I shall try sheer! Appreciate the work you put into each of these lessons. Worked like a charm, thanks again! I’m so glad it helped, it’s so frustrating when you’re trying to design something, you have a vision and it won’t work the way you wanted. Thanks for your comment, it is so useful and encouraging. I wish you would turn up your volume. I have the volume on my computer up as high as it can go and your voice is rather soft. Thank you. Sorry you’re having that problem. I will fix it. What version of Silhouette are you using? My screen does not look like yours.